“BIRDS IN SHOES AND BOOTS. WHY? BECAUSE IT MADE ME SMILE. OOAK!!! Each piece is hand crafted, designed and painted and signed by Artist, Steve McGovney. Slip cast and hand built low fire clay, acrylic and oil finish. Metal legs, Painted wood base. This bird measures 24" tall (including wire plume and base), 21" tall without the plume included. Base is 6.5" x6.5"" x 1.25". Bird measures is 4" tall, 13" long beak to tail and 3" across its back. Legs unscrew for shipping. All flight of fancy birds are one of a kind. Only one available. You receive the items pictured. PLEASE CLICK ON THE PICTURE AND ZOOM IN FOR BETTER DETAIL. One of a kind!! Each piece is hand crafted, designed and painted and signed by Artist, Steve McGovney. Slip cast and hand built low fire clay, acrylic and oil finish. Metal legs, Painted wood base. 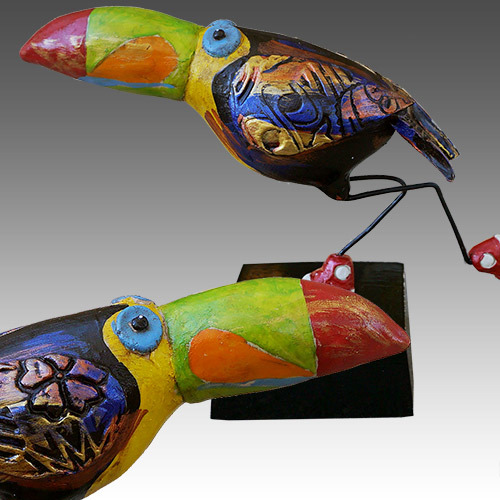 This toucan is aproximately 7" inch and measures 6 " tall including the base. Base measures 3" x 3" x 1.25". All flight of fancy birds are one of a kind. Colors may vary slightly from the picture. PLEASE CLICK ON THE PICTURE AND ZOOM IN FOR BETTER DETAIL.